Only in this fast-paced, Internet-savvy world in which we live could a series that is only 7 years old warrant a retrospective, but in all honesty, it’s probably a good thing that GamePro has created one. 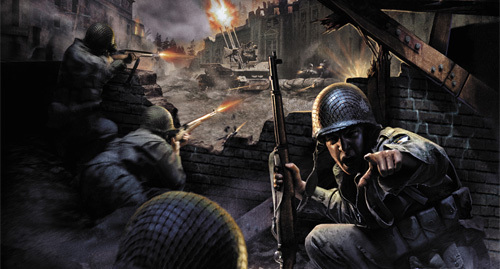 Personally, I didn’t pay attention to Call of Duty until the first Modern Warfare, mainly because I had been a Medal of Honor fan and after I soured on that franchise, I wasn’t looking to get into another World War II FPS. But after borrowing Call of Duty 4 from a friend, it only took an hour of multiplayer and I was hooked. It also helped that I tried the game out on a Double Experience Point Weekend. After that, I rented World At War and was pleasantly surprised and I own and still play Modern Warfare 2, although I know many of you are still upset with that one. Now I am looking forward to playing Black Ops when I get it for Christmas. So that’s my personal Call of Duty dossier. What about yours? After reading the retrospective, I realize I missed out on quite a bit. When did you enter the series? What was your favorite entry? Answer now, that’s an order! I bought the first game and LAN’d the crap out of it. Such good memories. Everyone I talk to seems to have a different favorite, I guess its because the experiences online. My brothers favorite is Call of Duty 3 (I was disappointed with it but I wont take that away from him) and when I asked him why he went into a story about how he was under fire from all angles and this random guy rolled a tank right next to him and yelled over the mic “Come with me if you want to live.” Everyones got stories like that and although they dont showcase how good the gameplay or whatever is, its what comes to mind when the game is brought up. It just proves how much of an impact multiplayer can have on your impressions of a game. Oh and Ill say it, Im not sick of WWII… after watching The Pacific on HBO I popped in WaW and played some 1943 all weekend. I was quite young at the time but I remember playing the first Call of duty and its expansion on the PC and it blew my mind (Later got it on XBLA for nostalgia). Although my favourite has to be Call of Duty 2 which I brought on both 360 and the PC because I loved it so much. Since then I have played the more recent ones but not really enjoyed them as much (with the exception of CoD4), maybe black ops will be different might have to rent it soon. I remember playing through some of Call of Duty 1 when it first came out over at a friend’s house, and was really blown away by the scripted events. At the time, I didn’t know anything about how that all went down behind the scenes for a game, so it seemed groundbreaking and original. Those sequences were a blast to play, and it’s something the series has become known for over time. Beyond that, I skipped out on 2 and 3, and have played each one since. My friend always got them on PS2 so I played them on his console. It wasn’t until I saw CoD4’s All Ghillied Up on YouTube that I really thought “Wow, I NEED this Call of Duty!” I’ve got each game since and, despite my misgivings of W@W’s atrocious outcome, I’m looking forward to Black Ops. @ Julez, CoD3 wasn’t a 360 exclusive. CoD2 was (and also on PC now that I remember). I still love CoD4 the best, although I’ve played a small bit of CoD2 and it was fun, but 4 was still better. MW2 murdered the franchise, but Black Ops won back some respect from me. I think you might need some therapy for your MW 2 hate,lol. LONG STATEMENT ALERT! I jumped in at COD2, which i still go back and play because it is so fun. I then got COD4,the only one i got a few days from the release date which i fell in love with immediately because Captain Price was back from COD2! I then got Call of Duty and was even happier that Price was in that too. Have not picked up any of the new ones but Black Ops single-player looks great. For me the single player was always the draw with multiplayer coming in second. I’m also sad that Cpt. Price may not return because of the Infinity Ward thing, he was in all of their Call of Duty games. So yeh. I absolutely loved the first game and the United Offensive expansion. I played the crap out of it…mainly because my computer wasn’t good enough to upgrade to CoD2. I’m still extremely good at the multiplayer in COD1 due to the fact I played it for about 4 straight years! I’m so glad that Treyarch has decided to keep some of the same traditions consistent throughout the franchise. Some of the characters such as Cpt.Price and Cpt Foley still show up in the new games, but I dont think ive seen Sgt Moody 🙁 The choice to play the game through different soldier’s perspectives was also a tradition found in COD1 that I still love. Of course, no game is a COD game without an awesome car(helicopter, snowmobile, etc) chase!!! The new CoD games are great and I think it’s awesome that they’re introducing fresh ideas, but I still love CoD1 the most.